This column first appeared on EducationNC on February 23, 2018. As a young child I was always taught the famous proverb: If you love your job, you will never work a day in your life. I discovered my passion in education—my love for learning and teaching. So I have truly never “worked” since I was 21 years old. As I matured, though, I realized that we all need continued inspiration to keep pushing toward the goal of creating successful students. After 11 years of teaching, I began to feel complacent. I knew the lessons. I knew the students. I knew the building. I knew the staff. My passion was dwindling. I needed to reach out and change lives in a different way. I focused first on my students—creating bulletin boards that showed the rigorous learning taking place, revamping plans for higher student engagement—and began to feel inspired. I remembered why the profession chose me. But many of my fellow teachers seemed tired and sad, going home weary every day with papers to grade and lessons to create. I began leaving notes on coworkers’ desks, sharing my ideas about what makes good readers. As teachers began to share what was working, students could tell. Scores were changing, and so were attitudes. But I wanted to inspire more; I wanted to reach more. How could I take this “inspiring gig” on the road? I needed not only my few scholars to be motivated to make high growth and proficiency, but all middle school scholars. Multi-classroom leadership funded my inspiration gig. Bruns Academy in Charlotte, in its first year using this role, made me the multi-classroom leader (MCL) for a team of three English language arts teachers focusing on grades six through eight—touching 252 scholars every day through these teachers and through directly teaching students. I tossed and turned the night before my first planning meeting with the team—it felt like my first day of school, and I was about to meet my “students.” The team consisted of a novice teacher, a teacher with my level of experience, and a seasoned teacher who felt sure of “what works best.” I was new to the school, but not the instructional content. The teachers wandered in with low heads, looking upset, because they wanted to be in their classrooms working on making them a welcoming an environment for students, not in my professional development. I began with an icebreaker designed to elicit laughter, and then started the first hard task of an MCL: building relationships. We focused on why they were in education at all. What was at the root of their desire to teach? Some teachers said their “why” was because they wanted to change lives as someone had done for them. Another said, “Why not me—if I do not teach my scholars, who will?” I told them the “why” would motivate them for the rest of the year. Together, we created our vision for the team as well as our students. In individual meetings, the teachers told me how I could best support them in their classrooms. With that, we entered the school year with a plan. Everyone was inspired! They had their “why,” they had their vision, and they even created lesson plans together to start the school year off. Then, school actually started—and all 252 students walked into the school, each needing something different. The vision changed, fast, because we realized that despite what we wanted—students who loved to read and came to school to learn—we received students who were not excited about being in middle school, who didn’t understand the value of reading, and who needed to know first that the teachers cared. Teachers were frustrated when we got the results back from our first common formal assessment: epic fail! I was crushed. We had done everything “right.” Suddenly I had to inspire myself again, before I could re-inspire my fledgling team. At our next meeting, I told them plainly that I didn’t know exactly what happened, but I knew that I had some of the best teachers and we had some great scholars—now we just had to discover how to reach them. We went back to reflect on our “why” again—what was our purpose? Working as a team, it didn’t take long to find new inspiration and hope. With clean sheets for new lesson plans, and better ways to approach the students who just didn’t grasp it yet, we tried again. We changed how we taught. The teachers changed the block set-up from whole-group instruction to small-group individualized instruction, so that each scholar’s needs are met on the student’s current level. As MCL, I also pulled a small group to assist the students who are below average to push high growth. And it worked for the students: On the next assessment, every scholar showed growth, and some even demonstrated mastery. We were working together, and we were growing together. We know that there will be some tough challenges ahead of us, but when it happens we turn to our “why,” and get inspired again. The feeling I get when I walk into a teacher’s class and help her co-teach her class, pulling a small group and re-teaching a skill that they didn’t understand at first, is amazing. I also give teachers support through professional development, which helps to perfect their craft. Opportunity Culture has given me a chance to inspire and be inspired again. In this structure, I get to change the culture of learning, every day—often through such simple things as a warm hug or a nice note, but also by giving students not just one isolated teacher, but two teachers working together who want them to succeed. With the support I can give, teachers and students both see their frustration levels fall. In the education world, we need to keep renewing our inspiration. Most teachers don’t enter the field because of the great pay; they come because of their passion to cultivate a culture of learning new things and to inspire greatness. With Opportunity Culture’s multi-classroom leadership, I have a chance to inspire more teachers and students with the opportunity to be the change they want to be. 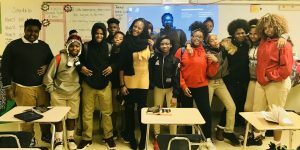 Candace Butler, a multi-classroom leader at Bruns Academy in Charlotte, N.C., has been an educator for 12 years, and plans to continue in this role to help support and inspire growth in her teachers and students.